Many traders spend years trying to find a trading strategy or trading system that actually works consistently over time. There is no shortage of vendors offering trading systems for sale that make claims of spectacular profits, which may or may not be true. Even worse, many of these trading systems are “black boxes” where the trading rules are not revealed. We have been following a trading system that looks promising and is certainly worth a review. All the trading rules of the system are completely revealed. 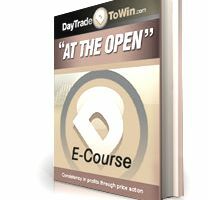 DayTradeToWin.com offers an e-course or trading methodology, At The Open, which we have followed for a couple months and the results have been very positive. The trading strategy only trades the e-mini S&P futures contract and it usually wraps up trading early in the day. The trading signals are not overly complicated, which is an added plus. Actually, we had a good working knowledge of the methodology within a couple hours. At The Open tends to get you into the market in the direction of the daily trend without chasing the market. Many of the trades are completed within a short timeframe for a quick profit. Discretion is left to the trader on whether they wish to take multiple signals throughout the day and use multiple exits on each trade. The system has a high percentage of winners, which I always like. There is also a risk management component to the trading rules that keeps you in most of the trades, but you will occasionally get stopped out. DayTradeToWin.com provides a daily performance history of trades since June 2008 on their website. The cost of At The Open is $497 and full disclosure of the trading rules are included. I was able to personally speak with the developer of the system, John Paul, and I like how his research disregarded many of the highly publicized indicators in favor of techniques used by professional floor traders. The cost of the course seems more than reasonable, especially if you find a system that stands the test of time. That remains to be seen, but I like what I have seen thus far. When you understand the logic behind these trading rules, it should also help you better understand how the markets work, as well as improving your trading. One problem with any how-to books or courses designed to teach you trading is the very reason that we went into the commodities trading business in the first place. The fact is that it is impossible to recreate any one trading day as each one is different. we went into this business because we never wanted to be bored with my job and after thirty-five years we can honestly say that each day was totally different. There are so many factors that influence commodity prices. The dollar, interest rates, the weather, geopolitical events, regulation, local issues and many other factors all contribute to the path of least resistance for commodity prices each day. While the course is well designed and the rules are explicit, we have found that successful day traders or longer term traders incorporate both fundamental and technical factors into their methodology and like the markets, no two are alike. The course is specific to E-mini S&P 500 futures contract, and many of the rules for trading in this highly liquid contract apply to all other markets. However, courses like this fall short when students look to them for all the answers. The fact is, those answers come from within each trader, and his or her success depends on the ability to create strategies that are within their comfort zone regarding risk and potential for rewards. All educational tools are great, and we encourage you to read all you can and attend courses to increase your understanding and comfort with markets. However, never look to one course, book or methodology as the best or only one to follow. The best results will come from years of experience remember to learn from mistakes and try not to repeat them.